I don’t normally list the quests before a dungeon such as this; however, we are waiting for the Khrysalis part two release. I wanted a reminder of what we did last. I thought you might too. Upon reaching the center of Fort Rachias, we located and combined the three parts of the Trine Key. We slid it into place perfectly and unlocked the great doors. As we entered the black, beating heart of Shadow, we explored the Hall of Trophies. It appeared several lost worlds were represented. A prisoner was being interrogated by the Umbra Legion! No biggie, we killed a few Leaf Shields (Rank 13 Life with 4,660 health) and freed her, Magalia Spiritcaller. Easy mob battle with Black Shields rank 13 Balance with 4,450 health and Leaf Shields rank 13 Life with 4,650 health. The only annoying spells to anticipate bothering you are Fortify, Gnomes and Power Nova. Unless you are a Life wizard, I wouldn’t even bother carrying a Cleanse Charm. You will likely see more than one Power Nova. Stack an extra blade and wipe the enemy out in one hit. Another easy mob battle with a Scorpion Grotesque rank 12 Balance with 3,375 health and Thousand Black Boots rank 13 Balance with 4,500 health. Again, expect Power Nova here, I saw three in a row. Power through it. In the third level Morganthe appears with her servant, Ghost Dog. The first it is a normal boss battle. The second is another story. 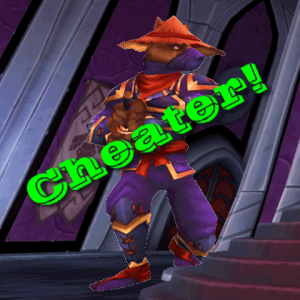 He uses a myriad of cheats which make things interesting if you stick around. Ghost Dog is a rank 12 Death boss 15,700 and 6-12 pips. Blade up, add Feints and use your favorite single enemy attack. This approach is best because he will use drain spells. 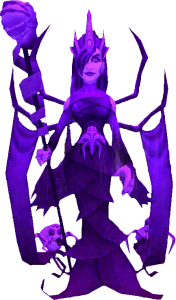 At under 16k health, you will find he is easier to take down then most of the bosses you have faced in Khrysalis. This version of Ghost Dog may be stunned. He has trained Feint. Stack your blades first. Hold on to your Feints until you are ready to attack or you may end up hitting his +30% instead of your (+70%) Feint. Death wizards will need to bring a Death Prism to convert damage. Use a drain spell for the added benefit of being at maximum health for the next battle. That brings up another point. You can heal although you may see an infection or two. It could be advantageous for you to heal up at the end of this round. If you do not deflect his attack cheats, you may be starting over. Ghost Dog now is a rank 13 Death boss at 27,200 health, again with 6-12 Pips, but this time with Shadow Magic. He will use it often. Prepare to receive Mass Infections, Feints, and drain spells from him. He also has Fortify and Shatter. Again, save your Feints until you are ready to strike so you do not end up hitting his +30 instead of your +70. Beware Death wizards! He does resist Death. A Scarecrow may be better than a Deer Knight since you will need to use a Death Prism and still take out all enemies. Shadow Ghost Dog is immune from stuns and Beguile. You can Stun and Beguile the minions. Shadow Ghost Dog does use Shadow Shrike with a +15 Backlash instead of +30. 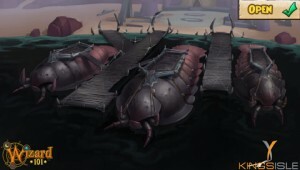 His Death Beetle attack leaves a +30% Death Trap. “Devote your body and soul to your master!” Shadow Ghost Dog summons the 3 minions. “Feel the poetry of war!” Shadow Ghost Dog casts a Damage over Time spell that deals Death damage to the wizard with the most blades. “The way of the Samoorai is found in death!” Shadow Ghost Dog issues a double Detonate of Death cast on the wizard who received the DoT. “Be resolved from the beginning!” Heals are allowed; however, if you heal with Rebirth he will shatter the healer thus removing the Spirit Armor. Don’t bother with shields at all, he will Shatter the caster of any shields. (Who needs shields anyway?? Not me!) 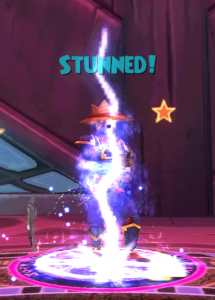 Also, Mass Prism and Windstorm seem to provoke Shatter. 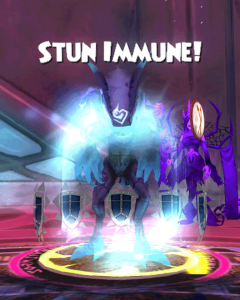 Be ready to defend yourself as he summons 3 minions of Fire and Storm. The Seijun Killer is a rank 12 Fire with 3,550 health and the two Hagakure Blades are rank 13 elite Storm with 5,060 health. Anticipate trouble from the minions: Fortify, Storm Lord, Leviathan, Sirens, Shatter, and possibly an Efreet. We have not seen Plague or Virulent Plague, yet since he is Death, I wouldn’t be surprised if they pop up. Send a wizard in first round alone, that wizard will draw spells like Leviathan and save your blades. Shadow Ghost Dog places a Death DoT on one wizard of your team. He will look for someone who already has blades before he casts. Use Strangle to prevent it or Triage to remove it. If you choose to ignore it, he will add a double Detonate (death variety) on the third tic at the beginning of round 5. Most likely this will be on the wizard who is preparing to damage him. Either avoid it or be ready to revive and replace blades as he wants that wizard outta there. Keep the fortify issue in mind when you calculate how many blades you bring. In the video below, you will see that I had no problem overkilling him in a minimal amount of rounds with a 3 wizard team. With enough blades and Feints, 27.2k +Fortify is easily overcome. Get your blades and Feints on and get out! Don’t mess with this dude or his minions! His DoT and Detonate hurt! Carry minimal cards in your deck so you are sure to get the spells you want. At the end, you receive the Harbringer of Light badge from Zaltana. I show defeating the entire dungeon using a team supporting a Death wizard as the attacker. There is not a huge disadvantage to any school in this dungeon. Don’t let Ghost Dog’s cheats intimate you. Where can I find Stone Blocks?